The 2013 William Howard Taft Presidential $1 Coin is issued by the United States Mint as the third strike of the Presidential $1 Coin Program. A portrait of President William Howard Taft, the 27th US President, is shown on the obverse of the strike. Coins of this series debuted in 2007 with a strike honoring the first US President, George Washington. Since then, four new coins have been issued annually in the program honoring the former US Presidents in the order in which they served. The series will continue at least into 2016, or until all eligible individuals have been honored. When the program debuted, these coins were struck and released into circulation. That policy ended in late 2011, however, as Secretary of the Treasury Tim Geithner ordered a halt to production for circulation as stockpiles of the coins were built up in Federal Reserve Vaults. Since then, coins of the series have only been struck for numismatic purposes. William Howard Taft assumed the office of President on March 4, 1909. A few years after leaving office, he became the Chief Justice of the United States. To this date, he is the only individual to have served in both positions. 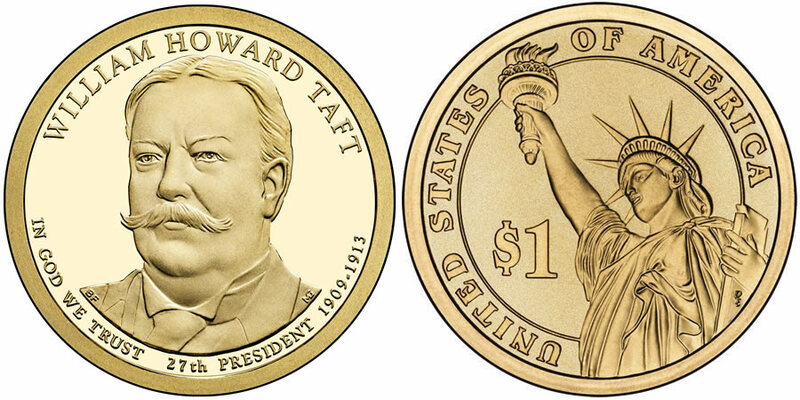 A portrait of the 27th President of the United States, William Howard Taft, is shown on the obverse of the coin as designed by United States Mint Artistic Infusion Program (AIP) Master Designer Barbara Fox and executed by United States Mint Sculptor-Engraver Michael Gaudioso. The portrait is surrounded by the inscriptions of WILLIAM HOWARD TAFT, 27TH PRESIDENT, 1909-1913 and IN GOD WE TRUST. All Presidential $1 Coins have the same reverse design of the Statue of Liberty . The design was originally completed by Don Everhart and is surrounded by the inscriptions of "UNITED STATES OF AMERICA" and "$1." 2013 and E PLURIBUS UNUM is inscribed on the edge of each coin along with the mintmark.